Have you been lucky enough to visit one of Yayoi Kusama‘s art exhibitions? Although we haven’t been ourselves, we’ve long been admiring her work and lately been seeing many photos & videos on social media from visitors to the current North American tour. You’ve maybe seen some of the spectacular images from her Infinity Mirrors Rooms or the inspiration for today’s project: the Obliteration Room. Kusama is well known for her use of dots in her work and the Obliteration Room invites guests to participate by sticking colored dots onto a completely white house. Watch a video all about the room and what kids think of it right here! 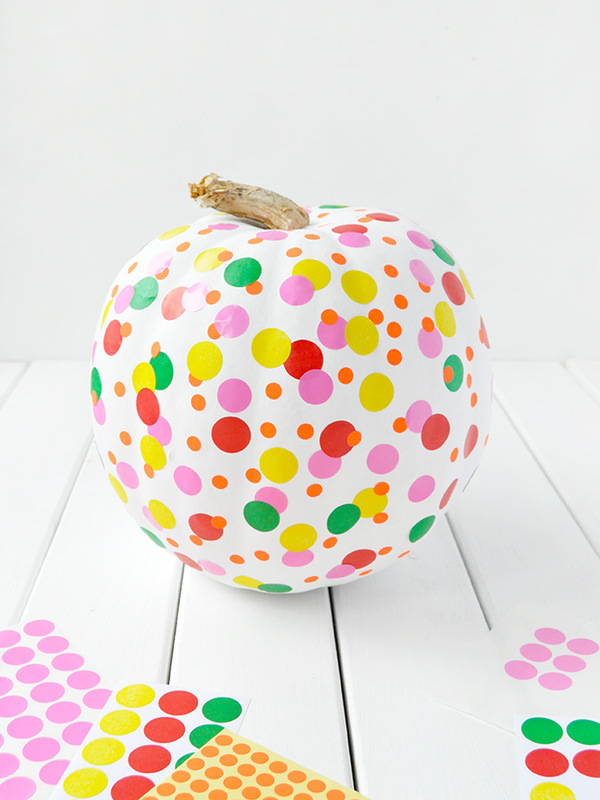 Kusama also happens to use pumpkins in her work a lot – she has said “Pumpkins bring about poetic peace in my mind. 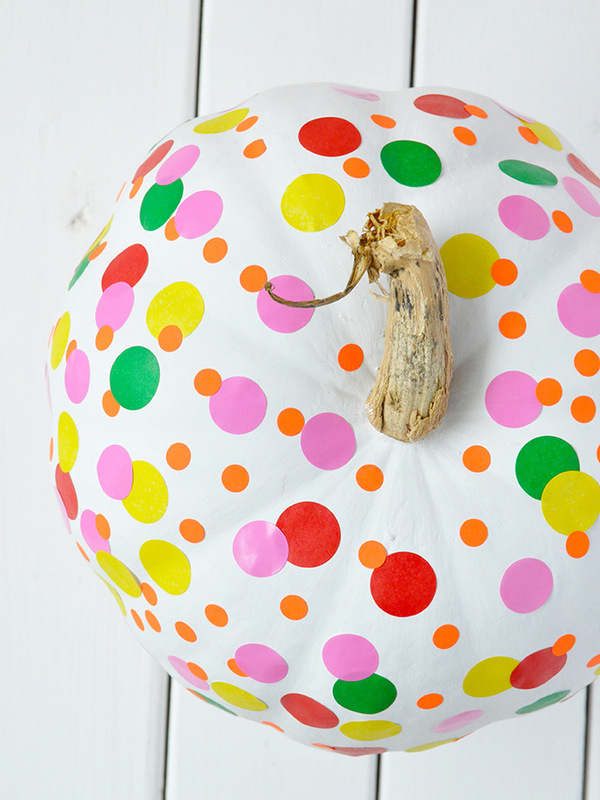 Pumpkins talk to me.” Kusama grew up on her family’s seed nursery in Japan and has been inspired by pumpkins ever since. 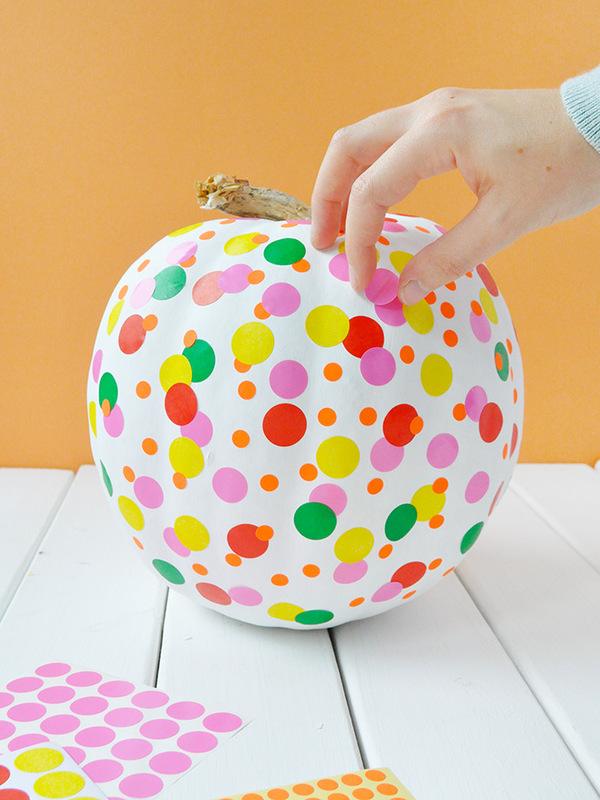 With all that in mind, we couldn’t help but craft this Yayoi Kusama inspired pumpkin for Halloween this year! 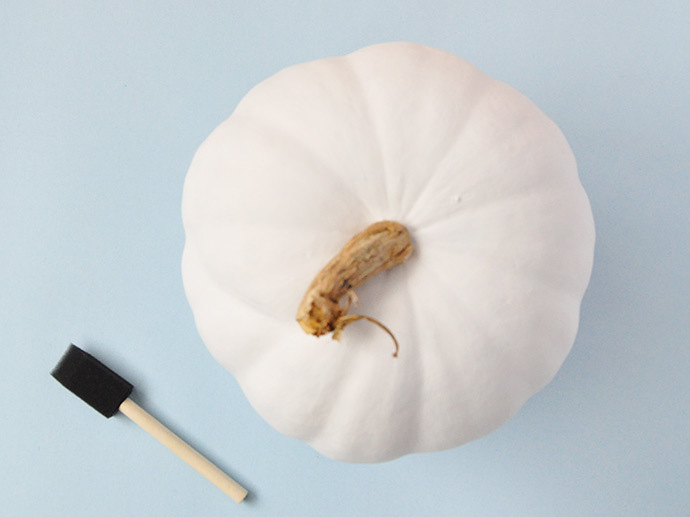 Wipe down your pumpkin with a damp cloth to remove any dirt or debris and let dry. 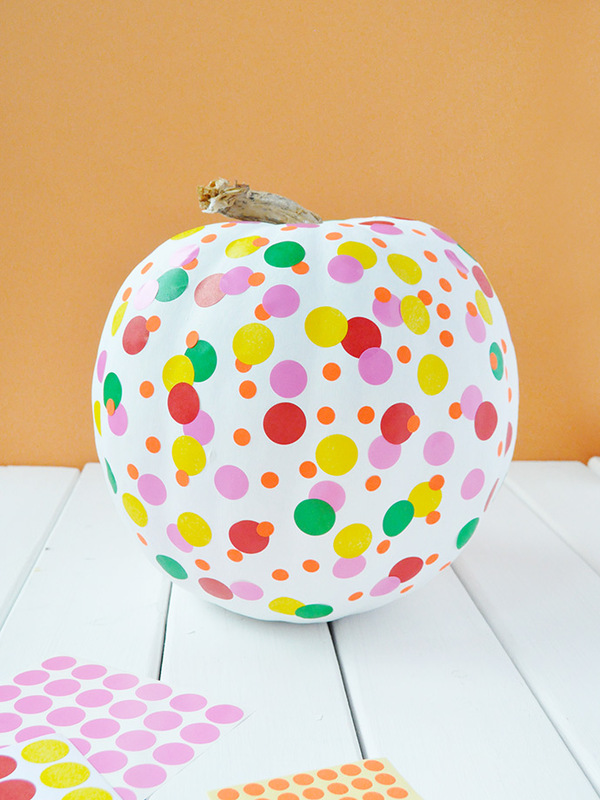 Paint the pumpkin with white paint (we used FolkArt Outdoor Acrylic Paint) on all sides until covered completely. Let dry. Get your stickers out and go crazy! We used a few different packs that we got at the dollar store and office supply store. Make sure you get all sides of the pumpkin. 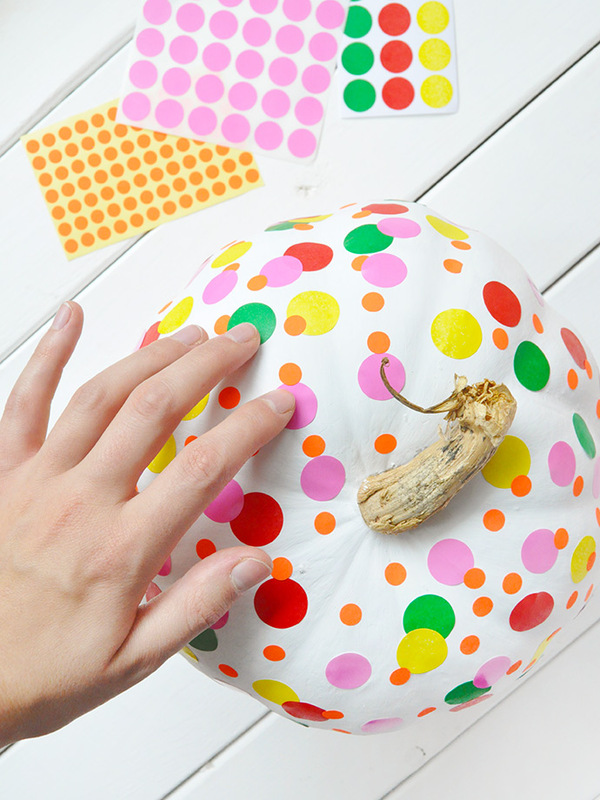 Once covered, leave as is or if you want to put the pumpkin outside your house in a spot exposed to the elements, we recommend applying a coat of Mod Podge to seal the stickers down. 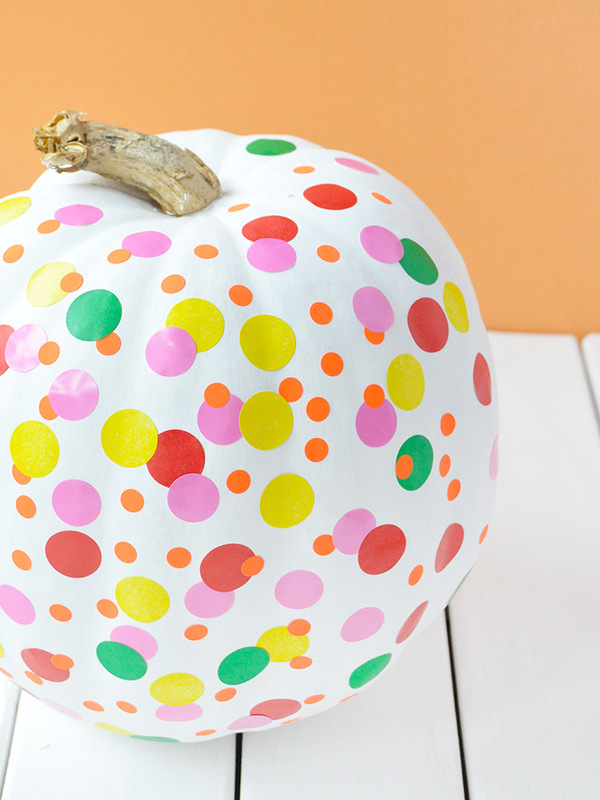 You can make the pumpkins ahead of time with your family, or you can leave the painted white pumpkin out at your Halloween party with stickers and let your guests get involved! 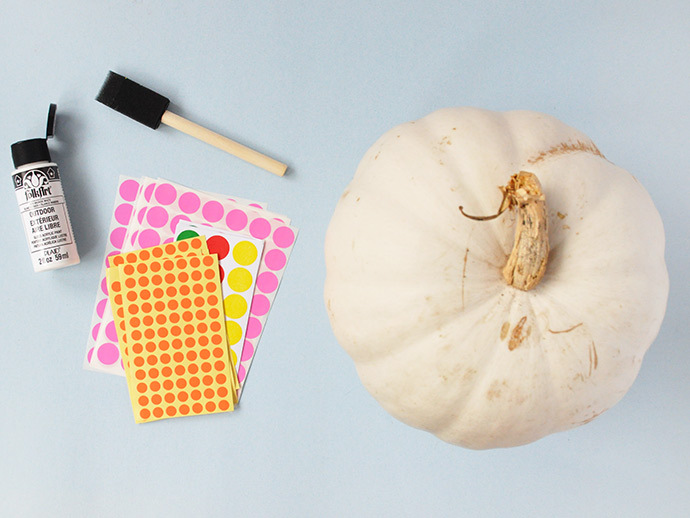 Read more about the Obliteration Room here and get inspired by more of Yayoi Kusama’s work featuring pumpkins here!